There are many ‘ordinary’ horse trailers being hauled on the highways today. They are regular horse trailers with regular features that do a regular job of transporting your horses. These are the trailers with unique features integrated into the design that make the trailer safer and easier to use. Plus, they just make the trailer cooler. These trailers are attention-grabbers! 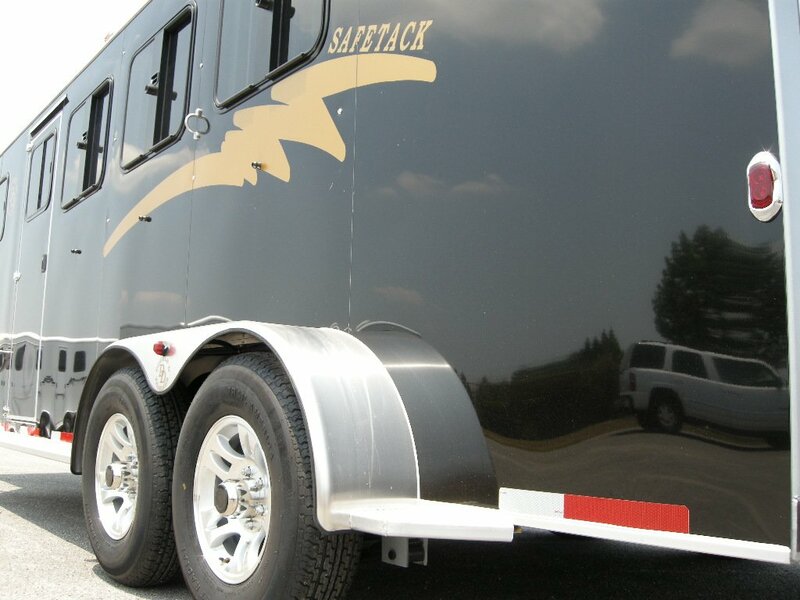 Here are 15 affordable features that add the ‘wow-factor’ to your new horse trailer. Anyone who has been on a trip with their horses knows that water can be a challenge. On longer trips, you need to stop frequently to let your horses re-hydrate with a heavy buckets that take forever to fill. Once at your destination, you will make endless laps back and forth from the water spigot to fill and refill those same buckets. Double D Trailers offers two types of watering systems right on-board their trailers to help ease this chore. First, we can install a corner water tank that uses gravity to fill a water bucket. Easily turn the knob and have a source of water right on your trailer to fill buckets or rinse off mud. This system can be tricky to install because plumbing lines need to run the length of your trailer. Since all of our trailers are 100% custom built, we are able to handle this challenge easily. Since we’re on the topic of keeping your horse nice and cool, let’s talk about fans. Windows and vents are great, but what if you need just a little bit more air circulation? Why not install individual interior horse fans? It’s like upgrading your horse from coach to first class! Most slant load horse trailers have a dangerous and scary narrow entry door. Horse and handler are forced to squeeze past a stationary rear tack storage area. This configuration can make a nervous loader balk. It can also be dangerous with less room to maneuver and less accessibility to the horses in an emergency situation. Double D solved this problem by creating the patented SafeTack design. Our forward or reverse facing trailers have an enclosed tack storage area that swings out like a second door. 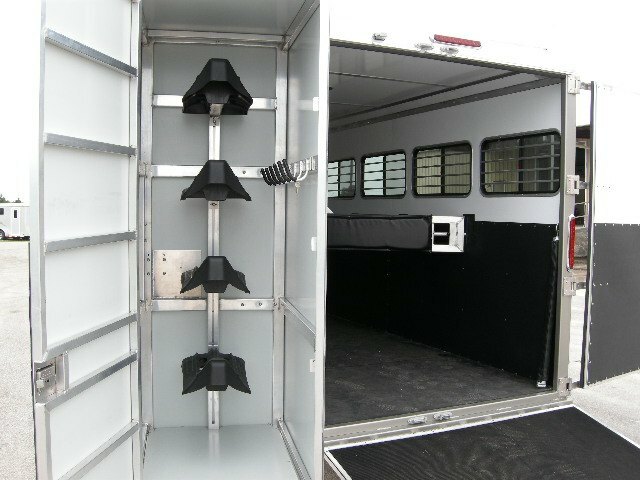 This allows a wide-open rear entryway for horse and handler to load and unload. Plus, the tack storage area can be stocked with saddle holders, bridle hooks, lights, a lock, and an accessory tray. It will keep your equipment ventilated, safe, and out of the way. This feature is sure to attract attention! Do you ever wonder what your horse is doing mid way through a trip? 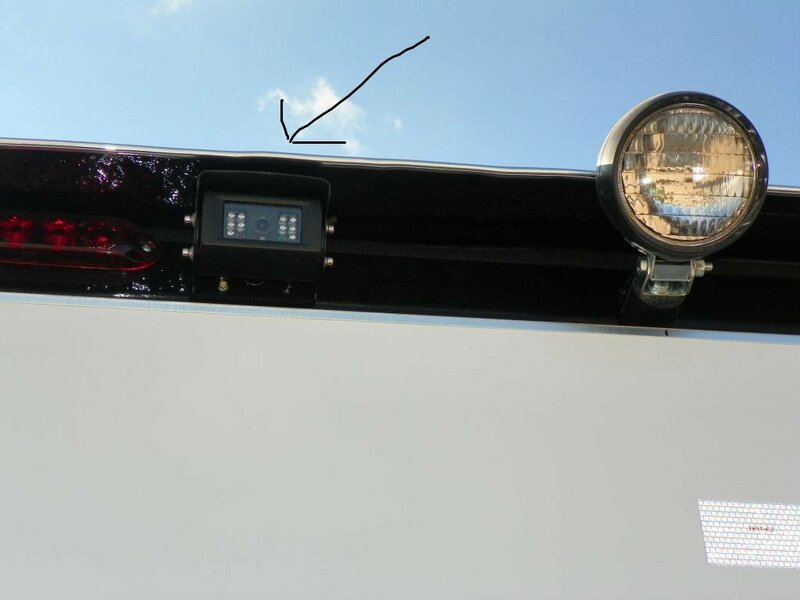 Convenient cameras feeds from Double D Trailers will let you keep an eye on your horses while traveling. Plus, a rear exterior backing camera can be a lifesaver! The system comes with two cameras and wireless monitor that plug into your 12V supply inside your tow vehicle. On one camera, you will have a view of your horses inside the trailer. The other camera is mounted on the back of the trailer to assist with backing. The next feature is a bit on the expensive side, but it’s pretty impressive. Double D Trailers installed a self-leveling system on a living quarters horse trailer for a client in Colorado. Ah...sweet cool relief! There’s nothing quite like stepping into air conditioning on a sweltering hot day. Double D can install air conditioning in the dressing room or living quarters of your horse trailer. If you want to kick things up one more notch, then opt for the “ducted air conditioning.” Instead of blowing air out directly from the AC unit, this type of system will blow air through ducts within a 3-4” space between the ceiling and trailer roof. Then the air is piped out through smaller vents located throughout the living quarters. “It blows nice and cool through these vents to keep you comfortable as you sleep,” Brad explained. While you’re hanging out in your air-conditioned living quarters horse trailer, you may want to listen to some tunes. Double D can install an outside roof antenna to power a stereo system with DVD player, Bluetooth connectivity, and inside/outside speakers. “It’s a really cool set up!” Brad exclaimed while showing off one trailer with this feature. He even pointed out a USB charging station that the client had requested to charge their devices. Double D Trailers tries to make the best use out of EVERY single space on the trailer. That is why Brad added in a unique hay bale holder on the side of the SafeTack compartment. This system has two pegs that fold out to provide a resting place for a hay bale stacked vertically against the wall. Then, there are places to strap the bale secure. 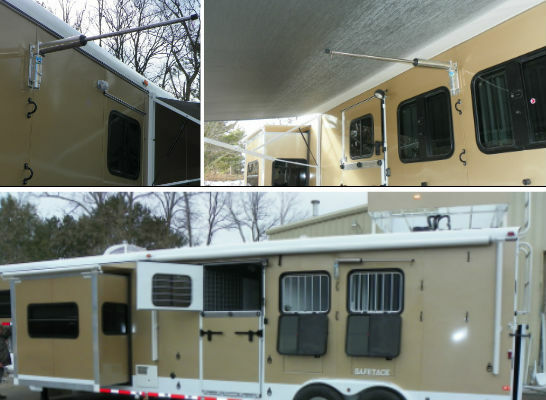 An awning is an excellent feature to have on any horse trailer. It gives you and your horses and extra shaded retreat during a sunny day. 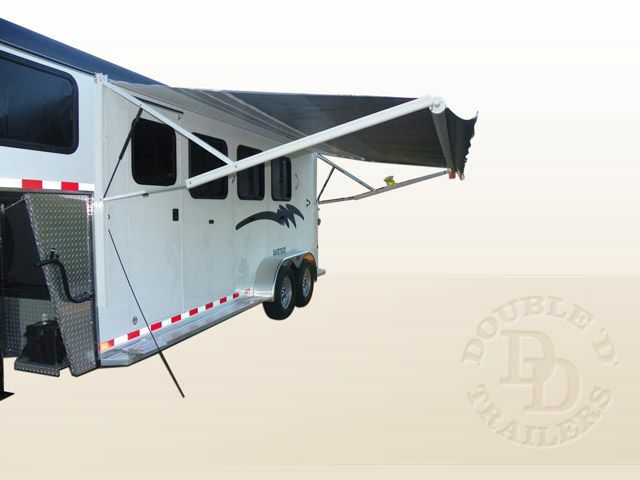 The two-step awning from Double D Trailers is extremely easy to deploy. Step 1: Flip the lever to the ready position. Step 2: Pull. That’s it! Every dressing room from Double D Trailers is fully customizable. One feature that is especially popular with our clients is a wall grid organizer system. This system lets you use the vertical wall space to organize supplies. If you live in an area that gets harsh winters, you are going to want aluminum wheels. They stand up to salt environments better than the typical powder coated steel wheels. Better durability means fewer headaches for you. Did you know that the exterior of your horse trailer is not always a safe place to tie your horse? Curious animals can damage your trailer and injure themselves if left unattended. That is why you may consider some special tying options available from Double D Trailers. First, you could have a tie extender installed on the side of your trailer. Brands like Tilt-Tie, TieRite, and HiTie provide extendable tie arms that swing out from the side of the trailer. Horses tied to these arms have more room to graze, drink and even lie down while tied. “These systems reduce damage to trailers and reduces injuries to the horses,” Brad explained. Second, you may consider a portable corral system. We like the Carri-lite corral panels that are made of telescoping PVC. They can be mounted directly on the side of the trailer for transport and are versatile. Wind, wind, wind…phew! You know the feeling of winding that handle to lift or lower your trailer. It can be exhausting. A full living quarters horse trailer isn’t right for everyone. Some people want a simpler option, but that doesn’t mean you still can’t have a place to clean off! 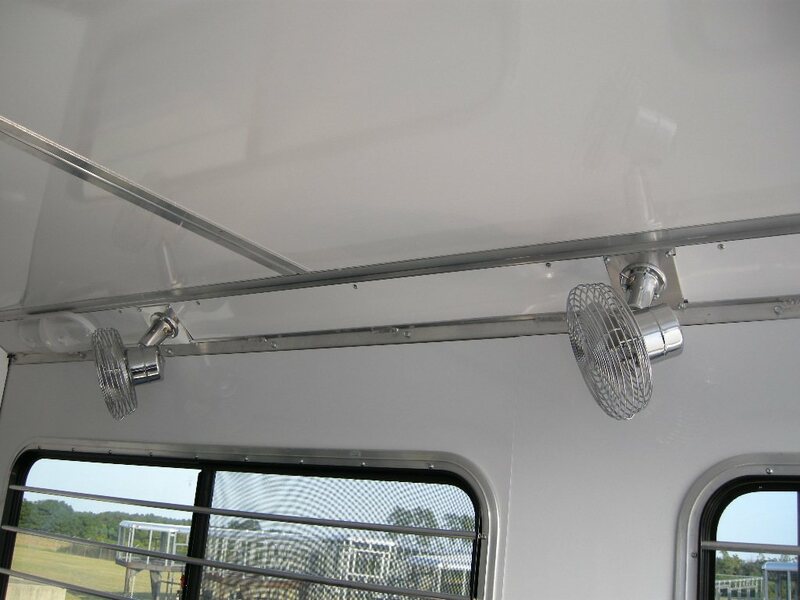 A cowboy (or cowgirl) shower can be installed in the horse area of your trailer. It provides you with a private place to wash off the sweat and grim of your day. This final feature is a ‘must-have’ for anyone who wants the best in convenience and safety. 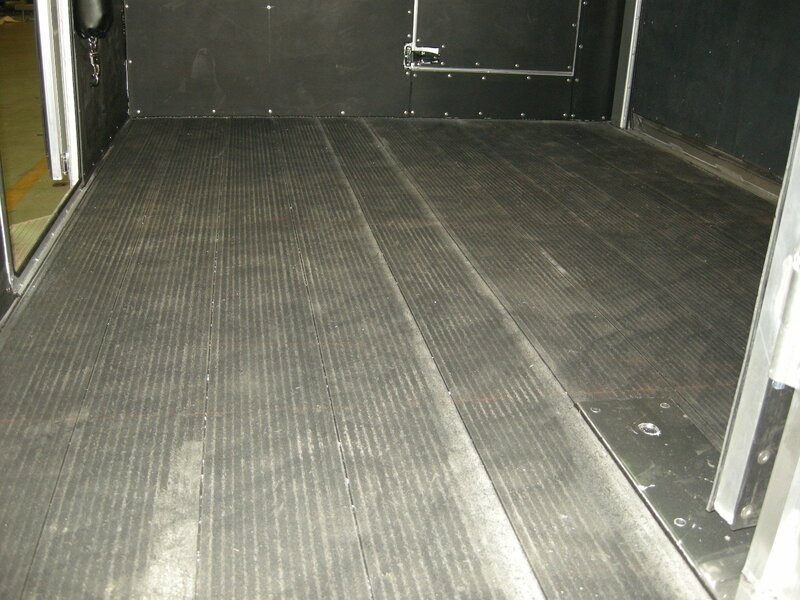 All-aluminum trailers often have aluminum floors covered in heavy (and we mean HEAVY) mats. Over time, moisture accumulates against the metal surface causing it to corrode. Dangerous holes can develop that spell disaster for your horses. We recommend pressure treated pine boards over metal floors. They provide a much safer alternative. Still, you will need those heavy mats on top periodically to check the integrity of the floor beneath. Rumber flooring provides an even safer and easier option. It is made from recycled rubber that forms sturdy inter-locking boards. They transfer less heat, noise, and vibration from the highway up into your horses’ legs. This helps prevent fatigue and stress for your animals. Best of all, it can be cleaned out easily with a hose and a broom. No mats are necessary! It can be a lot of fun to dream about the features you’d put on your new trailer. Still, we all have budget constraints, so it helps to be practical. Remember, our custom horse trailers are well equipped in the standard pricing so even if you order a "base" model; it has more equipment than most competitors on the market. If you are interested in designing your new dream trailer, then reach out to Brad today to start the conversation!